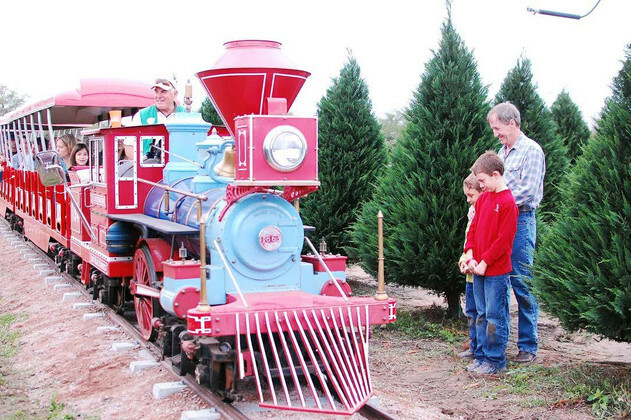 The popular, kid-friendly destination in nearby Brookshire known for it’s Christmas tree farm and year-round farm fun will now transform into a Christmas Village for Katy families to enjoy. After years of bringing Fall fun to the Houston community, Dewberry Farm is adding The Trail of Lights to the Christmas season. The Trail of Lights is a 1.5 mile wagon ride through the prairie and woods. Guests will enjoy over a million lights dancing to Christmas music. “Nothing can compare to the brilliance of the lights across the country sky while listening to festive Christmas music,” said owner Mary Emerson. She added, “There is nothing like it this close to Houston.” The entire farm will be transformed into a Christmas Village; there will be entertainment, food, and Santa will be available for photos. Tickets are $24.95. A limited number of tickets will be sold for each day by online only. Walk-ups are welcome but cannot be guaranteed ticket availability. Tickets include admission to the Trail of Lights and to the farm. Most of the 40+ attractions will be open during the Christmas season. The Trail of Lights is open from 4 -11 pm, December 7-10, 15-23, and 26-30. To learn more about Dewberry Farm please contact Jennifer Gorsché at Jennifer@DewberryFarm.com, or visit our social media platforms: Facebook, Twitter, or Instagram. Dewberry Farm, located on 115 acres just west of Katy, has a corn maze, pumpkin patch, and 20 acres of Christmas trees. The Fall festival runs through mid-November. Choose and Cut Christmas trees are available November 24 – December 10. Visit DewberryFarm.com for more information, or “Like” Dewberry Farm on Facebook, Twitter, or Instagram to receive updates.